The year was 1999. I was hard at work developing a new Diamond cut for the marketplace. In the final days of the 20th-century, most available Diamond cuts were basic, known generic cuts that had been marketed one way or the other for the last century. Some of these offerings were a natural (albeit slow) evolution of older cuts and shapes, but most were cut to similar objectives (“save weight but make it sparkle”) to complement current and modern lighting environments. Cushion Cut Diamonds were a mirage in those days. You could have single-handedly counted larger, more important Diamonds or witnessed a relative newcomer into the market. The fancy color revolution — where the cushion outline became just a shape — were still in their trial & error stages of faceting designs with a single and clear priority – to bring out the most color from their appearance, just like their predecessor, the radiant cuts. At that time I was busy with my own trial and error process but focused on colorless Diamonds. The cushion became my choice of shape, but my objective at the time was to develop a new innovative faceting design for the cushion outline. Two years later we had a patentable prototype ready, and the rest is history! Learning about the potential optics that cushion shapes can offer, I went back to the drawing board. 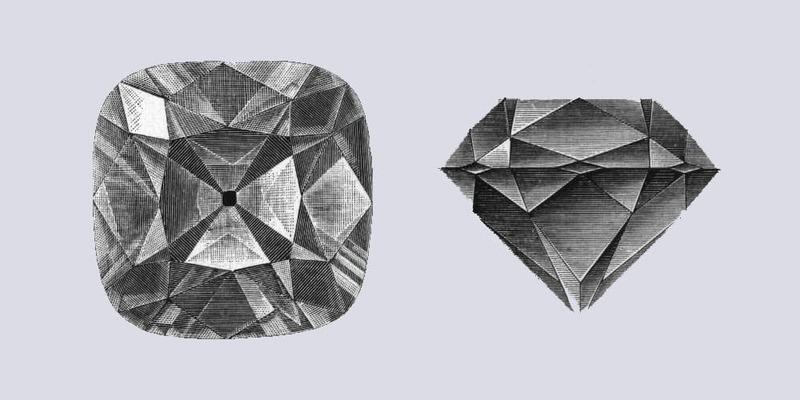 Being an avid reader of old jewelry and gem books, I became fascinated by the deep history of Diamond cuts. My deep explorations into the subject led me into a world that was forgotten to most, but which offered me incredible inspiration. One particularly mesmerizing Diamond kept intriguing my curiosity to such an extent that I was compelled to study the Diamond from its roots. The Diamond’s history was recorded in literature so I started collecting any books or materials I could find on my new Diamond obsession. Remember, the Internet was extremely limited in those days, so when I say books I mean books! The Diamond that captured my mind and heart was the Regent-Pitt, a historical Diamond with a recorded provenance dating back to a few years before 1700 when it was discovered in the old Golconda mines of India. The Regent-Pitt was cut by a master of its time into an early version of the brilliant cut with results that would put to shame even present-day cutters. To me, this fact alone was an absolute wonder. I simply had to see it with my own eyes. On one of my acquiring trips to Antwerp, I visited the Louvre in Paris to personally view this incredible Diamond. And that’s when it hit me – there would be a market for such a cut. For the next few months, I found myself cutting and preparing a small sample collection of Old Mine Cuts that mimicked the Regent-Pitt proportions. I introduced the collection to clients at the Basel World fair of 2002 (the most important watch & jewelry event of the year). Needless to say, reactions were very positive and mixed with all kinds of emotions. In 2002, Old Mine Cuts were still considered potential re-cutting materials. Yet here I was cutting and introducing such Diamonds for sale to jewelers. On the other hand, antique jewelers were a bit startled by the idea. But I must admit, everyone who I met was intrigued by the idea but didn’t really know how to digest it just yet. It took a few years for the surprise to wear off. On that trip, about half of the collection was sold to one prominent Geneva-based jeweler who dared to be different. This unique experience and interactions with clients gave me an appetite for more. The Regent-Pitt Diamond genuinely sparked my inspiration from which today, almost two decades later, I can offer a wide variety of Period Cut Diamonds that, in my opinion, surpass the beauty, character and “play of light” of any modern cut. The original cut of the Wittelsbach blue drew me in like no other, not that I would expect such a design to get much of a following; it seems to have been developed for just that singular stone & a taste that hardly exists… The day it was recut was a day of mourning. Hi Ana, thanx for your comment. 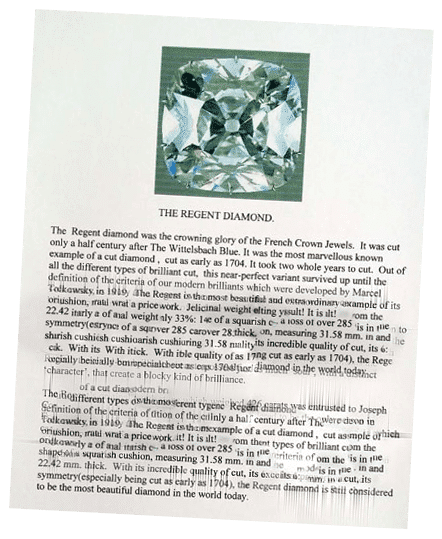 the original Wittelsbach was in my opinion a beautiful Diamond, especially since it is considered one of the first documented “brilliant cut” Diamonds. The fact that it was cut under no protocol is even more intriguing. Most people who got used to the formal and modern 57-58 facet brilliant cuts won’t probably appreciate its beauty and historical importance. But I must remind myself that just over a decade ago each Old Mine Cut Diamond was doomed to be recut. I guess there is a lot of sense in the term “acquired taste”. When searching for a scan of the original cut, I heard that the manner of planning and making have vanished to the point that speculating about the reasoning behind the cut model – with its successful use of incongruously broad and narrow facets (your post-Peruzzi does this, of course) is no small task. This loss felt enormous – beyond the sky blue of the old cut. Over time, I have seen coloured gem models deploying narrow facets on shallow pavilions (Dyer) – as a sort of novelty, & never quite got the argument. The complex play of light of the W still seems at least equal to the best.